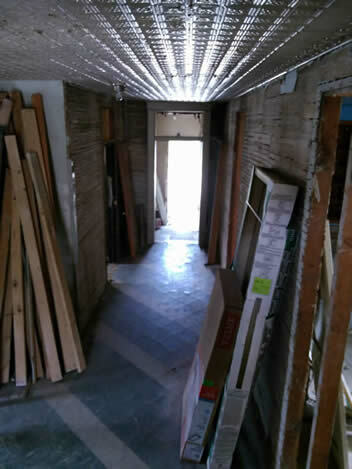 The building was built in 1906 by contractor Olaf Skram and stone worker Hans Lysne for the Maddock Investment Company who sold it to the Maddock Hospital Association for $270. The purpose of the building was to serve as a hospital for the area. The cement blocks were manufactured in Mr. Skram's factory in Maddock. According to the book Maddock: A 100-Year History 1901-2001, "the building will be 38x43, two stories high with full basement from concrete-stone. In the basement will be a large kitchen, laundry, heating plant and store rooms. 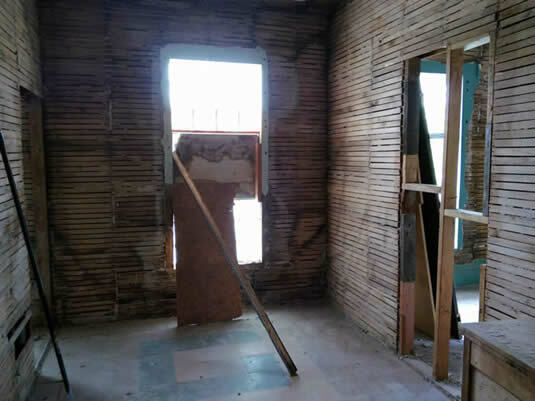 The first story will contain four rooms for patients, reception room, room for nurses and kitchen help, and bath room. Second story has six sick room, four of which are for single beds, nurse room and large operating room with sterilizing room and doctor's dressing room. There will be 22 beds in the wards. On October 25, 1906 North Dakota Governor Sarles laid the corner stone of the hospital shortly before he and his party left for Minnewaukan. January 10, 1907, the Maddock Standard reported that the business will be open for business on Monday, January 14th with a capacity of 17 rooms and a spacious kitchen in the basement. The building is heated by steam and will be supplied with all the modern appliances of an up-to-date institution for the comfort and convenience in care for patients. The hospital has been leased to Miss Olive Hovland, formerly head nurse at St. John's Hospital of Fargo, and the managers are satisfied that under her care patients will find themselves at home and well taken care of. Apparently, the need was not present and it was announced on May 28, 1908 that the Maddock Hospital is expected to close and that Drs. Thams and Wheelon were preparing to move west. In September 1909 Dr. Jess Henry Moeller arrived and established an office in the building but in the spring of 1911 he moved his office to the First National Bank building. Miss Burswald managed the building until it closed in April 1912. County records do not show what happened but it was reported that the building was foreclosed. 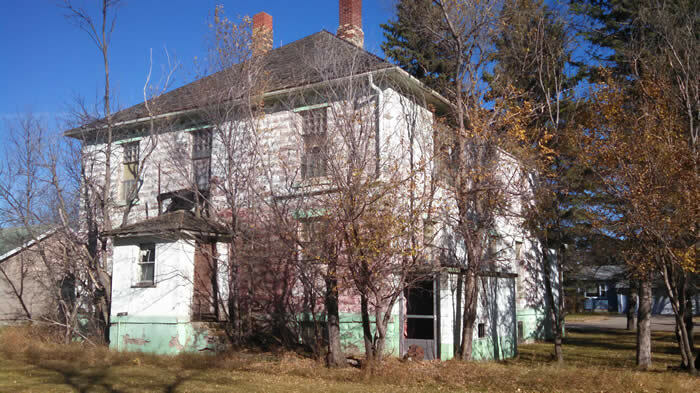 The records do not show anything until 1916 where the Maddock Hospital Association sold the property to Susan Waddell ("a single woman from Stutsman County") for the sum of one dollar. In 1918, she sold it to Foss Investment Company of Maddock for $147.25, D.O. Tollerud (sheriff) witnessed the sale. It was mortgaged through the Boney Shute Lumber Company. In June of 1919, the Foss Investment Company sold the property to Knud B. Erikson for the price of $3000. One month later, July 1919, Knud B. Erikson and Marit Erikson (note some documents indicate the spelling as Erickson) sold the property to John Bigaust for $1 and "other valuable considerations". On that same day, John Bigaust sold it to Knud B. Erikson and Mathias Johnson for $1 and "other valuable considerations". 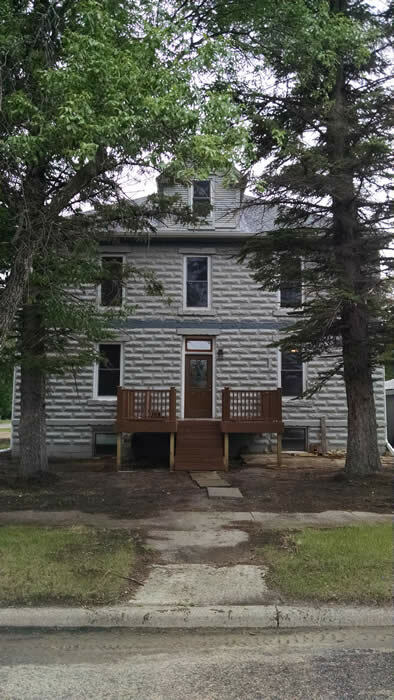 The next activity on the property was March 10, 1922 where Knud B. Erickson, his wife, and Mathias Johnson, "a single man", sold the property to Benson County, ND for $6,000. To the best of our knowledge, this building was used as the dormitory for students attending the Benson County Agricultural Training School (BCATS) from that point, the fall of 1922. It was the primary girls dorm housing students from the Ft. Totten area and the Belcourt area as well as local students during the winter months. On September 21, 1965 a vote was approved to hold a special election to dispose of the physical assets, real and personal of the Benson County Agricultural Training School. In June 1966 the Maddock Public School District no. 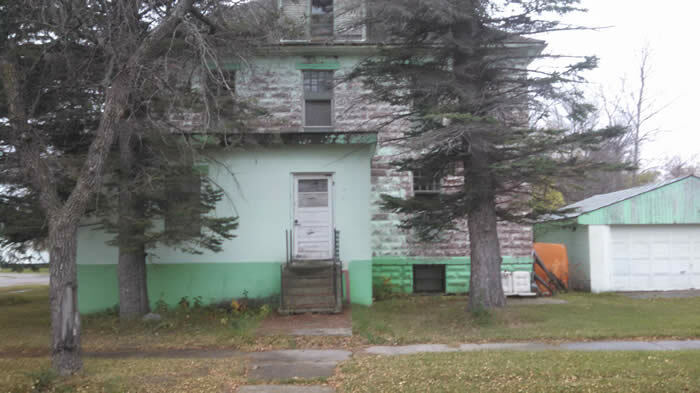 9 of Maddock, ND "indicated a desire to purchase the Benson County Agricultural Training School with all of its physical assets" for $25,000. This included the section of land this building is located. At some point in time, Richard & Connie Oksendahl and Jack and Geraldine Hoffner purchased the property. Then in 1978, Barry Hermanson purchased it from them. It was lived in for a few years then it became a storage place. 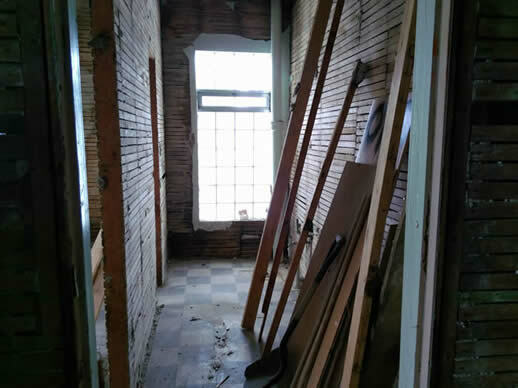 The building was used as a haunted house for many years but in the mid to late 1990's it was no longer used in this capacity. 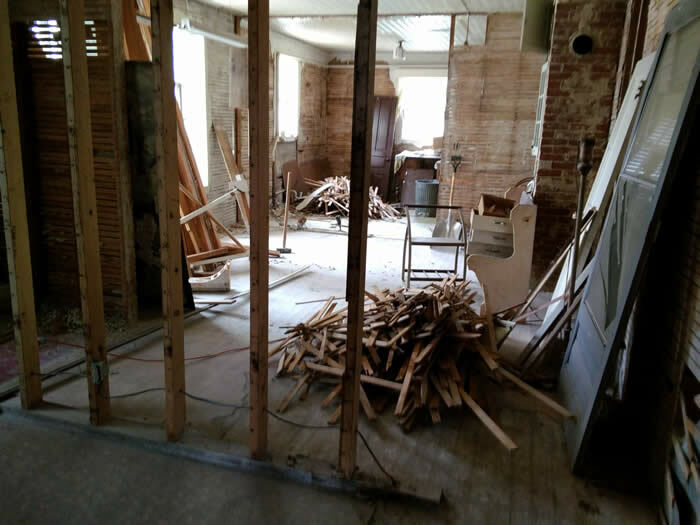 In November of 2014, Kory and Colette Boehmer purchased the property from Barry Hermanson and began the renovation process. Grand Prairie Inn & Apartments, LLC currently operates the building. Copyright ©2016 Grand Prairie Inn & Apartments - All Rights Reserved.